Most of the trucks that transport goods to and from Hyundai-Kia Automotives nearby plants go through this intersection in Cadca, Slovakia. A planned new road should help ease the traffic burden, but the project has been delayed by a lawsuit. CADCA, Slovakia -- This small Slovak town is located in the middle of a new Korean automotive cluster. The arrival of Hyundai, Kia and many of their suppliers has given the towns 27,000 inhabitants something they badly needed: jobs. But improvements to the local infrastructure have not kept pace with the surrounding areas rapid growth so Cadca residents now feel that their town is suffering at the hands of the industry that helped save it. Opened in 2006, Kia Motors plant in Zilina, Slovakia, is 33km to the south of Cadca and Hyundais plant in Nosovice, Czech Republic, which opened last year, is 52km to the northwest. The main road linking the factories, the E75, runs through the center of Cadca. Scury did not provide traffic statistics for Cadca, but the towns problems are easy to see: traffic jams, clogged and dilapidated intersections and soot-covered buildings. Another good indication of how much traffic has risen in Cadca is data on the number of trucks that cross the border between Svrcinovec-Mosty, Slovakia, and Jablunkova, Czech Republic. The border is just 7km away from Cadca so most of those trucks use the towns roads. Between 2005 and 2007, the number of trucks crossing the border has risen more than 200 percent to 1,034,000. 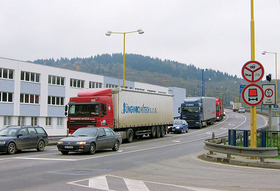 Cadca is on the main road between Hyundai-Kia Automotives plants in Zilina, Slovakia, and Nosovice, Czech Republic. Many of those trucks are going to or coming from Kias and Hyundais assembly plants. To relieve the strain on Cadca, a new road is supposed to be built north of the city. The road was due to open in 2010, but a lawsuit delayed things. This summer the courts rejected appeals by opponents to stop the construction of the road. At the town hall, the focus had shifted away from creating jobs to rebuilding a community.